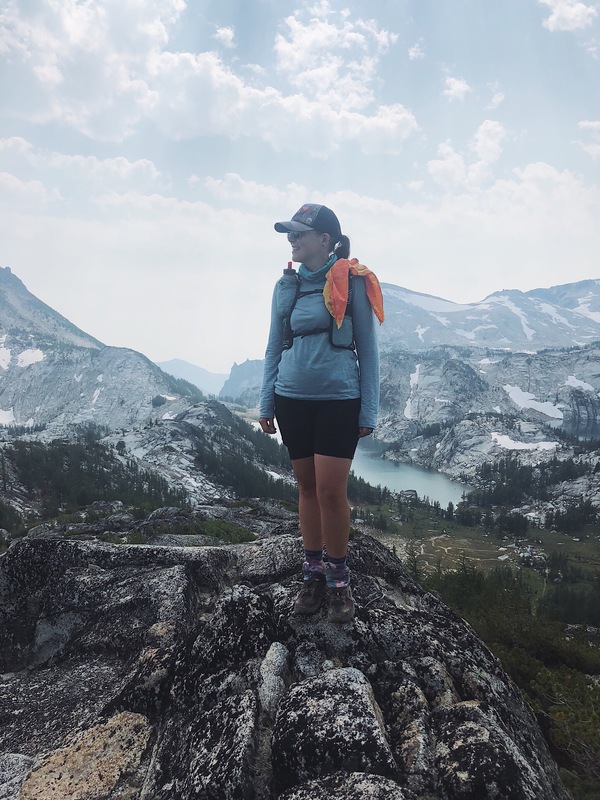 I thru-hiked the Enchantments on Friday, and it was glorious. J. and I drove up to Leavenworth on Thursday via the Gorge, stopping at the Deschutes River State Recreation Area to go for a run (him) and a short hike (me) followed by much-needed partial (me) and full (him) immersion in the river — J.’s watch told him it got up to 108 degrees F during his run, and I believe it. In Leavenworth we ate veggie wursts buried in caramelized onions and kraut (when in faux Bavaria…) and then found a campsite not too far from the Snow Lakes Trailhead. On Friday morning at 6am, we met the guy behind the Loop Connector shuttle at the trailhead, and he drove us back past our campsite to the Stuart Lake Trailhead. “What time do you guys think you’ll finish?” he asked us. “I have no idea,” I told him. J. asked me what my worst-case guess was. “10:30?” I was basing that off vague memories of the day-hikers I met last year while backpacking with a Snow Lakes permit, but I didn’t really think it would be that late. After all, I’m a super-fit PCT section hiker! I hiked 32 miles in a day the other week! 19ish would be a piece of cake. At the trailhead, we filled out our day-use wilderness permits and started uphill around 6:30. 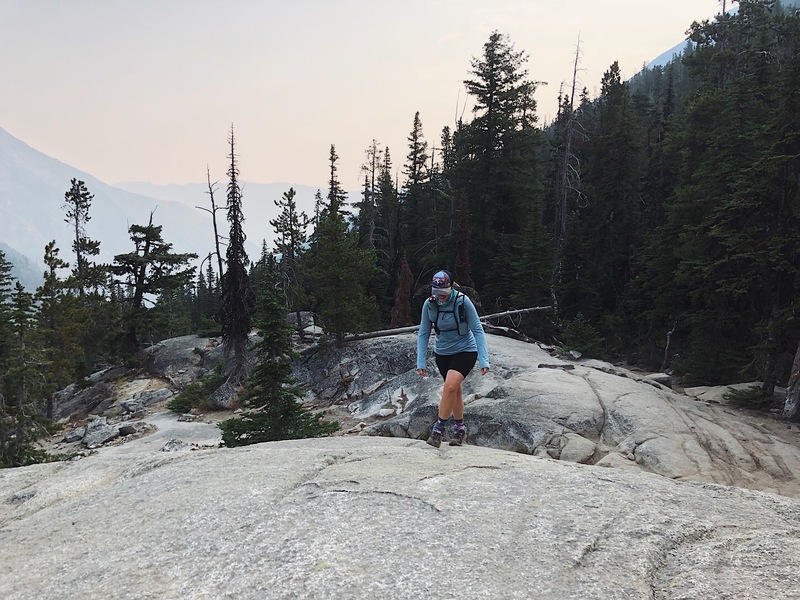 I was hiking and J. was running — we planned to meet next at Colchuck Lake. I found him instead a little before the lake, napping on a giant rock with a beautiful view of the surrounding hills. J. ran ahead and I continued on past Colchuck Lake towards Aasgard Pass. The lake was impossibly turquoise, and the trail was already a little harder to follow than I expected. The PCT is so easy — well-defined, well-marked, gently graded. But I was not on the PCT anymore! 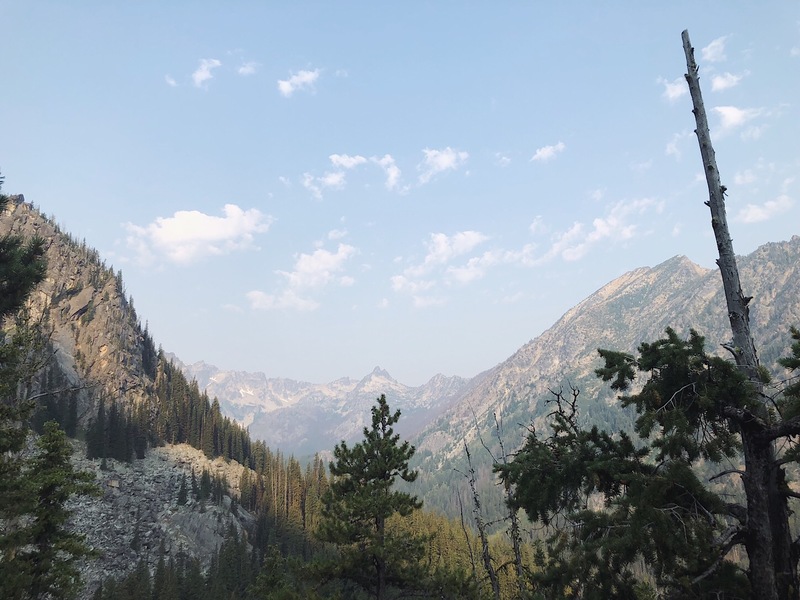 The trail was rocky, rooty, steep, and oh-so fun… but it was past 9 by the time I met J. again where the trail left the lake and began to ascend towards Aasgard Pass. We followed cairns and sometimes bits of trail across and up the talus slope, crossing waterways and listening for the eeps of pikas. Every time I turned around to look behind me I grinned. Every time I looked up from where I was placing my feet I grinned. The sun behind the clouds above the pass cast rays of light, a picture of heaven — “We’re climbing to heaven!” I yelled to J. Two hours and one false summit later, we topped out, and there was Isolation Lake. We took a snack break and watched a mountain goat be its goat-y self hopping across some rocks. I descended towards Inspiration Lake, where J. and I planned to meet. The spot I’d pointed to on the map turned out not to be the spot I remembered — whoops. I found a rock to wait at where I’d be sure to see J. come down the trail, and I watched a mountain goat browse its way across some rocks and then settle down on a high perch for a while. A group of backpackers swam in the lake nearby — I regret that I didn’t use my time waiting for J. to swim myself. I felt a little awkward so near another group, and I didn’t want to risk missing J. when he came by, since we had no way of communicating with one another at a distance. So, I waited and snacked, and eventually he came down the trail. We traversed the next bit of trail more or less together, J. running off ahead but stopping here and there to look around and take it all in. I found him at a side trail, gesturing for me to come over, watching a small group of goats, including a kid, graze in a little meadow. “In how many miles?” I asked him. “Sure,” I said, and we started up. The trail led to a saddle next to Prusik Peak. On the other side of the saddle, we looked down towards Shield Lake. The view was, as promised, incredible, in every direction. Gaia’s topo showed a dotted-line trail curving around past Gnome Tarn and back down to the main trail through the basin, so we figured we’d give it a try instead of going back down the way we’d come up. We managed to find a few cairns, but pretty quickly realized there was no trail to speak of. We followed the line on Gaia and picked our way down a ridge, over rocks and around bushy plant growth, until, near the bottom, we finally found trail again. At Leprechaun Lake, I took my shoes and socks off and soaked my feet, then waded in up to my thighs. My knees were sore and creaky, unused to all the steep ups and downs. After a while, we continued on to Lake Viviane, and from there down the steep descent towards Upper Snow Lake. It was late afternoon already, but I was still (irrationally) optimistic about finishing before dark. We hiked down, down, down. J. ran ahead and said he’d wait up at the dam between Upper and Lower Snow Lakes. I found him there as the sun slipped behind the hills, and we headed on towards Nada Lake. In the decreasing light, he kindly stayed not too far ahead of me, waiting up every mile or so. Once, I saw him ahead of me in a thimbleberry patch, and when I caught up he turned to me with a half dozen berries in his palm. “For me?” I asked gratefully. Yes! Nothing better! When the light faded entirely around 9, I turned on my headlamp and kept walking, trying not to think about cougars. J. waited for me every quarter mile or so. It was just about 10 o’clock when we finally crossed the bridge over the river and hiked the last couple hundred feet up to the trailhead. I was exhausted and done. But what an incredibly beautiful, fun day. When can I go back? “Hey,” J. told me, “this hike included your two favorite things: boulder hopping and night hiking.” He meant it sarcastically — talus and darkness have historically freaked me out and left me frustrated and cranky. I’d be lying if I said the day was totally devoid of frustration and crankiness, but mostly it was wonderful. I felt strong and capable (if understandably sore and tired by the end) and everything was gorgeous. …and the Enchantments definitely is the most beautiful place in the world. When can I go back and do it again? © 2019 slow glowing|ProPhoto Website by NetRivet, Inc.